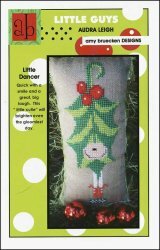 Little Guys: Audra Leigh [C8934] - $6.00 : Yarn Tree, Your wholesale source for cross stitch supplies. Quick with a smile and a great, big laugh. This "little cutie" will brighten even the gloomiest day. Stitch count 35 x 82.